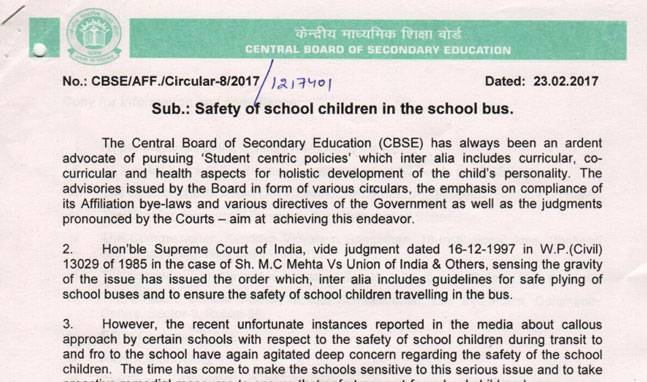 "The school authorities are directed to voluntarily evolve an arrangement, that in each school bus, at least one parent should be present who can oversee the conduct of the driver and the other staff present in the bus," read the circular.To ensure security of the children, the Central Board of Secondary Education has directed the schools to appoint guards on school buses and to install CCTV cameras, GPS systems, sirens and grilles in the vehicles. In addition, such school buses should have one lady attendant and a parent to look after the driver and conductor. "The school authorities are directed to voluntarily evolve an arrangement, that in each school bus, at least one parent should be present who can oversee the conduct of the driver and the other staff present in the bus," read the circular. The board in its notification said that the institutions will be responsible in case of any security lapse, and it can lead to cancellation of affiliation.As per officials, on the directions of Human Resource Development Minister Prakash Javadekar, the guidelines were issued and it is applicable for all CBSE-affiliated schools including Kendriya Vidyalayas. "The windows of the bus should be fitted with horizontal grills with mesh wire. The school buses should be fitted with speed governors with max speed limit of 40 km/h. GPS and CCTV arrangement should be made compulsorily in each school bus and is in working condition at all the time," reads the circular.